Every experienced vaper understands the importance of good quality rechargeable batteries when it comes to achieving the perfect vaping experience. Ideally, they will have a high mAh, ensuring maximum puffs achievable before recharging becomes necessary and, when that fateful day comes, possess the potential for a long and trouble-free recharging life. Sadly, however, such batteries do not come cheap, which is not what you want to hear if you gave up smoking partly to save money! This has led many of us on an endless quest; trawling through the pages of Amazon, Ebay and the myriad of sites in search of a cheaper alternative. Then, you spot one, a brand name you recognize – the UltraFire 18650 4000mAh. A 3.7v battery with a 4000mAh? Sounds too good to be true right? Well, that's because it is. Let's make one thing clear shall we? There is no such thing as an UltraFire 18650 battery with a 4000mAh. Take a look at UltraFire's direct sales website (www.ultrafire-shop.net), no listing for such a battery exists and nor should it anywhere, the limit for this battery type being set at 3100 mAh. What the website does feature is what it calls a 'Bad List Website', a list of all the websites that sell fraudulent UltraFire batteries, and there are some surprisingly familiar names on this list. So, let's just say that you did succumb to temptation and have ordered the cheap but impressive sounding 'UltraFire 18650 battery with 4000mAh', what can you expect? Well, not 4000mAh - that’s for certain! The battery has much less capacity than stated on the cell, but they both have the same capacity, i.e. they can be used in series. The battery is only good for light loads. Because the batteries are matched in capacity, I will call them acceptable as a cheap battery'. And there you have it, fraudulent or not, they are a cheap battery and you do tend to get what you pay for. 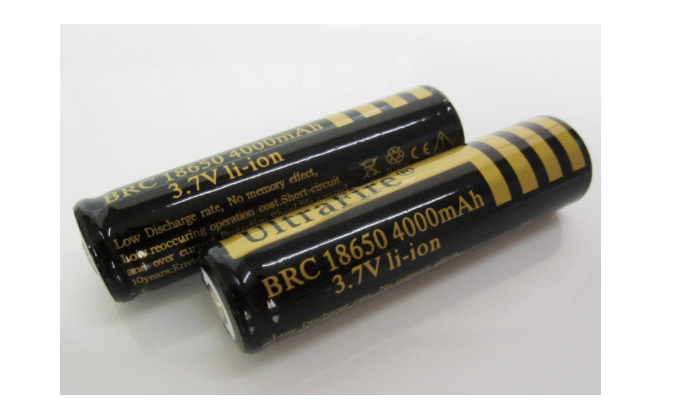 Testing of 18650 batteries below $3, some of them UltraFire, revealed similar results, none of them achieving or indeed coming anywhere close to their mAh charge rating. A quick look at the packaging (or should I say, repackaging?) is enough to tell you that these batteries only have an 'actual capacity 2600mAh', and even this figure seems optimistic. If you were disappointed by the claims of high mAh, then you're going to be crushed by the news that these batteries aren't in anyway reliably rechargeable. Of the UltraFire battery reviews featured on Amazon, more than a quarter were complaints that involved recharging – most of these batteries failing to make it passed their third recharge. So having purchased a product that shouldn't exist, with no rechargeable life worth speaking of, there is only one conclusion to be reached. Apart from being obvious UltraFire fakes, these batteries are far from new and are, in fact, little more than recycled cells (check the metal tabs on the terminals), and as such could never provide the power and reliability you would have expected from a new battery. After reading this Ultrafire 18650 review, you’re probably thinking - So what are the alternatives? Having all but naysayed the cheaper options, what advice is it now possible to offer? Well, obviously the best type of battery is one that suits your individual needs and those of your equipment, and one whose mAh matches its voltage so there are no nasty surprises. If I had to recommend a battery that had similar capabilities as those offered by the UltraFire and was reliable, then I would need to move the financial goalposts a little higher to around the $12.95 mark and the Sony VTC4 18650 2100mAh. The mAh of this battery is of course lower, but the amount of vapes possible before recharging is variable depending on the amount of time you wish to use it – a 42000 mA vape being possible for half and hour if you so wish. And again, its Sony, a reliable brand. Giving up smoking is stressful enough, a reliable brand will save you the heartache and avoid the disappointment created by cheaper and fraudulent brands such as the UltraFire 18650 4000mAh discussed in this review.